Nature saves me at some point almost every day. It saves me from rushing, overwhelm, preoccupation, dissatisfaction, criticism, unhappiness, anger, misunderstandings and on and on. The list is endless. And on days when I’m not any of those things, at the very least, the natural world uplifts me out of the ordinary. Nature stops me in my tracks and invites me to notice earth’s magic. It stops me with the smooth flight of a bird, the sound of the wind through the leaves on a tree, the unfurling green of a fern, a tulip opened wide revealing its hidden beauty or by a soft or dramatic cloud formation. 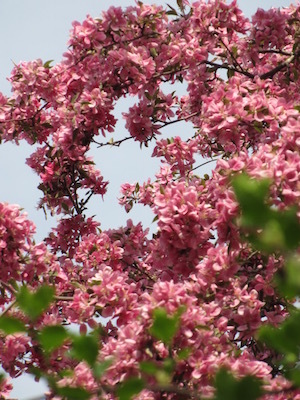 Just yesterday when I was going out to empty my compost, which I consider a slightly icky job, I was awakened by pink petals; pink petals that were sifting down from above through the warm spring air to offer me blessing. Nature gives me a fresh new perspective. How have you been saved by nature today?